India, already the world’s biggest milk producer and beef exporter (mostly water buffalo), is investing in research to ensure that its poorest people reap increasing benefits from raising farm animals and do so in increasingly sustainable and healthy ways (photo credit: ILRI/Susan MacMillan). Key recommendations from a high-level partnership dialogue held last November (2012) by the International Livestock Research Institute (ILRI) and the Indian Council for Agricultural Research (ICAR) have recently been published. These policy recommendations from ILRI and ICAR were released last week in New Delhi, India, by ILRI’s director general Jimmy Smith and ILRI’s deputy director general for integrated sciences John McIntire. The ILRI-ICAR white paper distills major recommendations made at the partnership dialogue and serves as a basis for pro‐poor and sustainable livestock policy interventions in India. The following excerpt is from the executive summary of this new publication. ‘With 485 million livestock plus 489 million poultry, India ranks first in global livestock population. Livestock keeping has always been an integral part of the socio‐economic and cultural fabric of rural India. In recent years, India’s livestock sector has been booming. Livestock now contribute about 25% of the output of the agricultural sector and the sub‐sector is growing at a rate of about 4.3% a year. With over 80% of livestock production being carried out by small‐scale and marginalized farmers, the benefits livestock generate for India’s poor are enormous and diverse. ‘Aimed to help cultivate joint learning, knowledge exchange and future partnership, the meeting brought together participants from 12 countries, including India. The attendance comprised of senior departmental heads in the government, directors of ICAR animal sciences national institutes, university vice chancellors, deans of veterinary universities, senior staff of leading non‐governmental organizations operating, representatives of farmer cooperatives, heads of private‐sector companies, and leaders and managers of international agencies including the Bill & Melinda Gates Foundation, the United Nations Food and Agriculture Organization (FAO) and the World Bank. 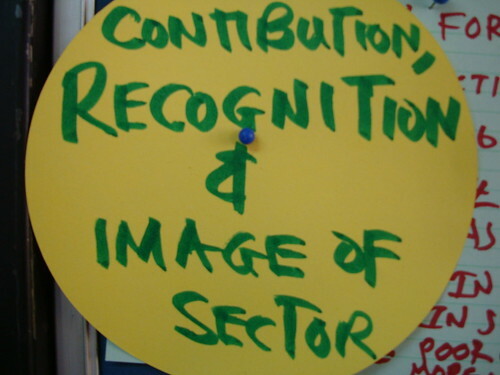 All members of the ILRI Board of Trustees participated, as did officials of other CGIAR bodies operating in India. ‘The high‐level dialogue was inaugurated by Dr M.S. Swaminathan, renowned for his role in India’s Green Revolution of the 1960s and 70s. Dr Swaminathan stressed the urgent need for research and development partnerships to maintain sufficient momentum for the Indian livestock growth story. . . .
‘The gathered experts articulated the challenges and opportunities for the country’s millions of farmers trying to earn their living from small dairy and ruminant enterprises. What was critical was the consensus among experts in understanding that development of the country’s livestock value chains depends as much on smallholder access to services and inputs as it does on supply and marketing of livestock and their products. The participants also agreed that transforming India’s livestock value chains required better infrastructure and development of a policy framework for improved animal breeding. 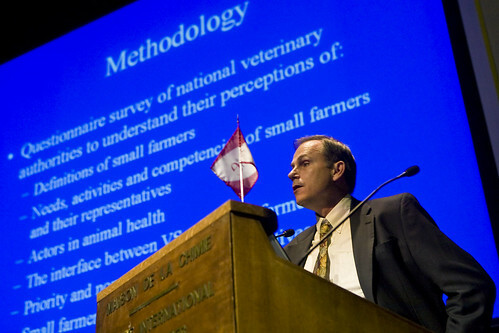 ‘A subsequent session on animal health highlighted the need for better disease diagnostics, more affordable vaccines and better veterinary service delivery for small‐scale livestock keepers if the country was to succeed in better controlling diseases of livestock, as well as the many ‘zoonotic’ diseases that originate in farm animals and infect people as well. The experts in the session agreed that ICAR‐ILRI partnership should aim at capitalizing on ICAR’s excellent decision‐support system for predicting animal disease outbreaks in the country, and modify it further so as to make it highly valued and accessible for extensive use by scientists, administrators and policymakers alike. ‘In another session presenting problems in animal nutrition, it was agreed that both conventional and new technologies should take ecological as well as economic considerations into account. With constant increase of animal numbers anticipated over the coming decades, fodder scarcities will have to be addressed through research work conducted to ensure the bio‐availability and digestibility of fodders available to India’s small‐scale livestock farmers. ‘All sessions of the all‐day dialogue named productive partnerships as crucial to bringing varied expertise together for designing sustainable solutions. In unison, the participants opinioned that such multi‐institutional and multi‐disciplinary expertise must understand that India’s animal expertise needs to ‘go to scale’ even as resources in fodder, land and water become ever more stretched. Download/read the publication: Livestock research and development summary report of the ICAR-ILRI Partnership Dialogue, 2013. India’s booming livestock sector: On the cusp?–Or on a knife edge?, 8 Nov 2013. ILRI technician Cecilia Muriuki prepares protein samples in one of ILRI’s animal health laboratories (photo credit: ILRI/Susan MacMillan). Global life science tools company Illumina (NASDAQ: ILMN) has announced the recipients of grants from its ‘Agricultural Greater Good Initiative’. One of these is the BecA-ILRI Hub, a state-of-the-art biosciences laboratory and facility platform located in Nairobi, Kenya. The Biosciences eastern and central Africa-International Livestock Research Institute Hub (BecA-ILRI Hub), says the news release from Illumina, is ‘pioneering applications of Illumina technologies to increase crop yields and reduce poverty and hunger. . . .
BecA-ILRI Hub will use the grant to expand its study of genetic resistance to cassava brown streak disease and cassava mosaic disease, both of which have infected large percentages of crops across East Africa where cassava is a major source of nutrition. ‘”There is nothing more foundationally important to health than food, and Illumina is excited to be involved with organizations working at the forefront of food security,” said Jay Flatley, President and CEO of Illumina. “Collaboration will enable the power of genomics to impact more people and on a global scale.”. . .
‘In 2012, Illumina broadened the scope of the Agricultural Greater Good Initiative through engagement with the Bill & Melinda Gates Foundation and Dow AgroSciences, as well as with the Feed the Future Initiative of the United States Agency for International Development (USAID). Read the whole news release at Illumina: Illumina announces recipients of Agricultural Great Good Initiative grants: Expanded program focuses on improving food security and furthering agricultural sustainability, 15 Jan 2013. Illumina is a leading developer, manufacturer, and marketer of life science tools and integrated systems for the analysis of genetic variation and function. It provides innovative sequencing and array-based solutions for genotyping, copy number variation analysis, methylation studies, gene expression profiling, and low-multiplex analysis of DNA, RNA, and protein. It also provides tools and services that are fueling advances in consumer genomics and diagnostics. Illumina technology and products accelerate genetic analysis research and its application, paving the way for molecular medicine and ultimately transforming healthcare. Illumina’s Agricultural Greater Good Initiative, launched in 2011, helps to spur critically needed research that will increase the sustainability, productivity and nutritional density of agriculturally important crop and livestock species. Grant recipients receive donations of Illumina reagents to support their projects. 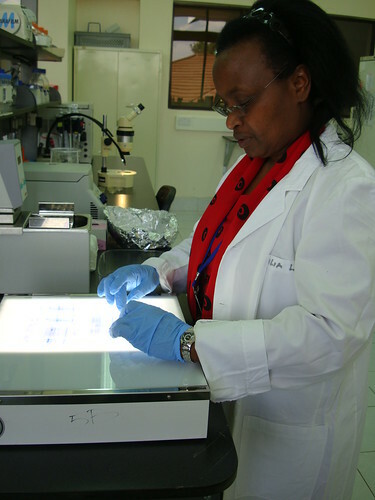 The Biosciences eastern and central Africa-International Livestock Research Institute (BecA-ILRI) Hub is a world-class agricultural research and biosciences facility located at and managed by ILRI in Nairobi, Kenya. It provides support to African and international scientists conducting research on African agricultural challenges and acts as a focal point for learning, interaction and strategic research — enabling collaborations in the scientific community to benefit African farmers and markets within the region. The Hub was established as part of an African Union/New Partnership for Africa’s Development (NEPAD) African Biosciences Initiative, which employs modern biotechnology to improve agriculture, livelihoods and food security in eastern and central Africa. 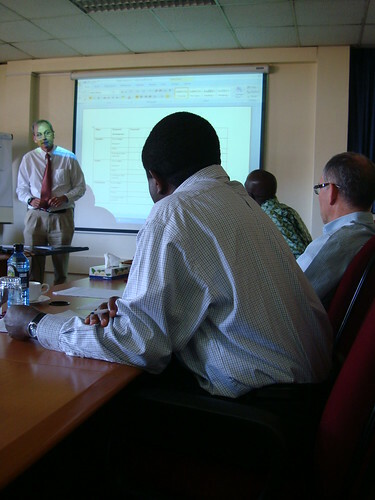 ILRI is a member of the CGIAR Consortium. CGIAR is a global agriculture research partnership for a food-secure future. 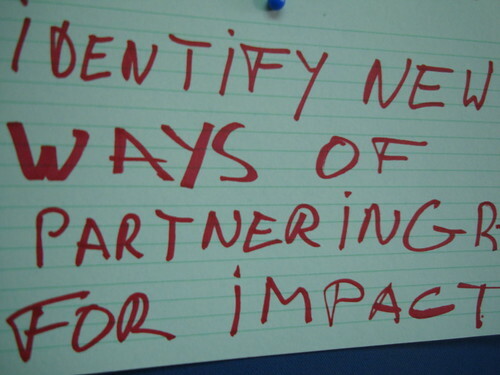 Its science is carried out by the 15 research centres that are members of the CGIAR Consortium in collaboration with hundreds of partner organizations. 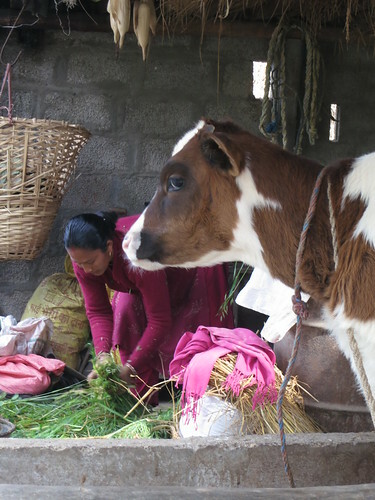 Dairy woman Nimala Bogati feeds her improved dairy cows green fodder. 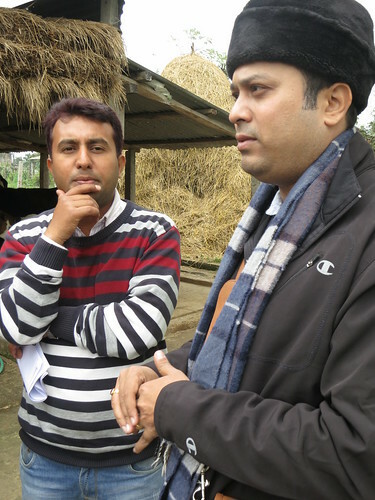 An ILRI-CSISA project on the Indo-Gangetic Plains of Chitwan District, in south-central Nepal, began in Sep 2010. Project staff are introducing residue-based feeding strategies supplemented with green fodder and concentrates to increase cattle and buffalo milk production (photo credit: ILRI/Susan MacMillan). 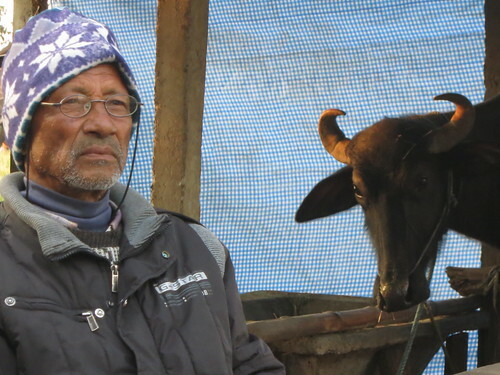 Starting in 2010, feed‐related aspects of dairying in two municipalities of Chitwan District in south-central Nepal have been investigated by staff members from the International Livestock Research Institute (ILRI) and a local Nepali non-governmental organization called Forum for Rural Welfare and Agricultural Reform for Development (FORWARD). This study set out to gain an understanding of the overall dairy production system in this district, with a particular focus on the livestock feeding strategies employed by farmers, and to identify key areas of the feeding strategy that could be altered to improve livestock productivity. A feed assessment tool called FEAST—a questionnaire that combines informal group discussions with structured interviews of key farmer informants—was used to rapidly assess on‐farm feed availability in a smallholder context. FORWARD’s Deep Sapkota and ILRI’s Arindam Samaddar confer on a visit to a smallholder dairy producer in Gitanagar, Chitwan District, south-central Nepal (photo credit: ILRI/Susan MacMillan). Project staff from ILRI and FORWARD selected the municipalities of Gitanagar and Ratnanagar for this study because these sites were to become part of projects conducted by a multi-institutional Cereal Systems Initiative of South Asia (CSISA) in Nepal. Farmers in this area generally have very small plots of land, averaging just 0.24 hectares, from which they produce a wide variety of crops. Rice, maize and wheat are the dominant cereal crops here. Goats and dairy cattle, predominately Holstein-Friesian and Jersey, are the main livestock kept. Some households also keep dairy buffaloes and poultry. Dairying and other livestock activities contribute 63% of household income, cropping the remaining 37%. Crop residues (most of which until recently were purchased) are the primary component of the feed for the farm animals and are relied on throughout the year. Purchased concentrate feeds such as wheat bran and commercially mixed rations provide a significant portion of the dietary metabolizable energy and crude protein. ILRI has been working with FORWARD for just over one year to improve understanding in these farming communities of key animal health, nutrition and reproduction concepts, so that the farmers can reduce the costs of their milk production, with purchased feed being the main cost. Two goats kept by a farm household in Nepal in a community served by the ILRI-FORWARD-CSISA project (photo credit: ILRI/Susan MacMillan). Goats are the most popular livestock species kept within the area. 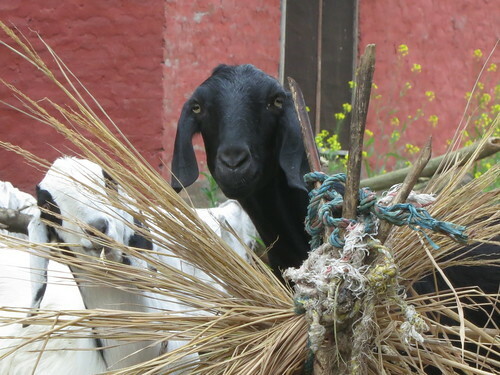 Eighty percent of households keep 2–3 goats, which are used to fulfil household meat requirements and/or sold at irregular intervals for slaughter. Half the households here keep improved dairy cows, primarily Holstein-Freisian and Jersey, with each household keeping some 2–3 cows. About 10% of the households maintain local buffalo, and 5% improved buffalo such as Murrah, for milking, with each household keeping 1–2 animals. Local cows and buffalo are the cheapest dairy animals available, costing about 10,000Rs (USD$141) and 30,000Rs (USD$423) per head respectively. Improved cows and buffalo are available for 80000–90000Rs (USD$1128–USD$1269) per head. Dairy animals in this area produce approximately 3141 litres of milk per head per year, with sales of milk generating 249446Rs (USD$3519) per household annually. Bhim Bahadur Bogati, father-in-law of dairy woman Nirmala Bogati, and his son’s staff-kept buffalo cow (photo credit: ILRI/Susan MacMillan). The dairy animals are usually maintained in purpose built sheds in close proximity to the household and stall fed throughout the year. The shed will generally only have temporary walls that are erected during winter months to keep the animals warm. During summer months, the walls are removed to allow air to circulate around the animals to keep them cool. To find out more, read: Characterisation of the livestock production system and the potential of feed‐based interventions in the municipality of Ratnanagar and Gitanagar in the Chitwan district of southern Nepal, September 2010. Feed for livestock is often cited as the main constraint to improved productivity in smallholder systems. Overcoming this constraint often seems an elusive goal and technical feed interventions tend to adopt a scattergun or trial and error approach which often fails to adequately diagnose the nature of the feed problem and opportunities and therefore the means to deal with problems and harness opportunities. The purpose of the Feed Assessment Tool described here is to offer a systematic and rapid methodology for assessing feed resources at site level with a view to developing a site-specific strategy for improving feed supply and utilization through technical or organizational interventions. Output from FEAST consists of a short report in a defined format along with some quantitative information on overall feed availability, quality and seasonality which can be used to help inform intervention strategies. 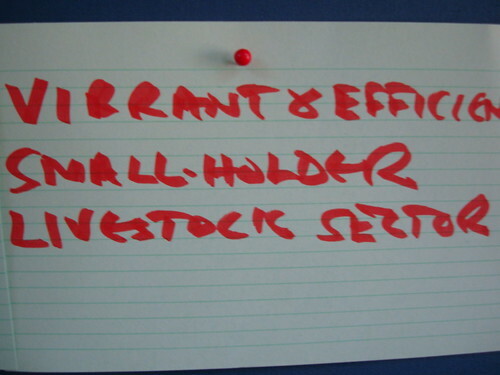 The tool is aimed at research and development practitioners who are working in the livestock sector and need a more systematic means of assessing current feed-related strategies and developing new ones. The Cereal Systems Initiative for South Asia (CSISA) applies science and technologies to accelerate cereal production growth in South Asia’s most important grain baskets. CSISA works in partnerships in 9 intensive cereal-production ‘hubs’ in Bangladesh, India, Nepal and Pakistan to boost deployment of existing crop varieties, hybrids, management technologies and market information. CSISA is funded by the Bill and Melinda Gates Foundation and the United States Agency for International Development and conducted by the International Maize and Wheat Improvement Program (CIMMYT), the International Food Policy Research Institute (IFPRI), ILRI and the International Rice Research Institute (IRRI). Last September, ILRI held a workshop in Dehradun, northern India, to develop a tool for feed technology screening and prioritization. Last December, ILRI and national research institutions and NGOs from Bangladesh, India and Nepal conducted dairy feed experimental trials and demonstrated better use of crop residues for feeding to their dairy cows. Thirteen participants from four sites in Haryana, India (National Dairy Research Institute); Bihar, India (Bihar Veterinary College, Sarairanjan Primary Agricultural Cooperative Society); Chitwan, Nepal (Forum for Rural Welfare and Agricultural Reform for Development); and Dinajpur, Bangladesh (Bangladesh Livestock Research Institute, Cooperative for Assistance and Relief Everywhere) shared their results of the feed intervention trials and related training activities. This week (21–22 Feb 2012), an inception workshop for an Ethiopian Livestock Feeds Project (ELF) is taking place at ILRI’s campus in Addis Ababa, Ethiopia. The project involves a short scoping study that will be used to help further develop and test rapid livestock feed assessment methods such as FEAST and Techfit. This work is funded by the Australian Centre for International Agricultural Research. Last week (13 Dec 2011), aid agencies that have funded Biosciences eastern and central Africa Hub (BecA Hub), a shared state-of-the-art research and capacity building platform hosted and managed by the International Livestock Research Institute (ILRI) for the region, convened an all-day meeting at ILRI’s Nairobi headquarters. The purpose of the meeting was to harmonize support being provided to BecA and African biosciences and to explore sustainable models for building on the momentum that BecA and its supporters have created. Syngenta Foundation for Sustainable Agriculture. This donor alignment meeting came appropriately on the heels of a recent first meeting of the CEOs of both NEPAD, a program of the Africa Union celebrating its tenth anniversary, and ILRI, one of 16 centres belonging to the Consultative Group on International Agricultural Research (CGIAR), now celebrating 40 years of operation. ILRI director general Jimmy Smith thanked Mumba for his message and then framed the ensuing discussion in a talk and slide presentation. The following are excerpts from his talk. 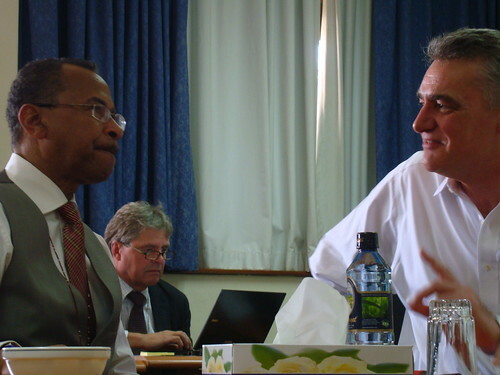 ‘The idea for a Biosciences eastern and Central Africa platform started when I worked for CIDA. It is an initiative I’ve supported since its inception. 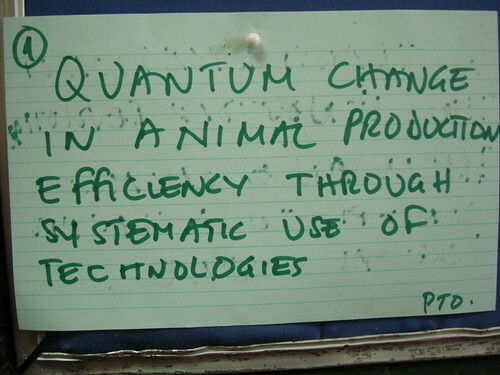 And I’ve been thinking about BecA since before I rejoined ILRI this November. ‘I liked BecA’s business plan but thought it lacked the “demand side”. I discussed this with Syngenta’s Marco Ferroni, and told him that it’s possible that different donors have different expectations of BecA. I want these to be aligned so that I can fulfill on them. 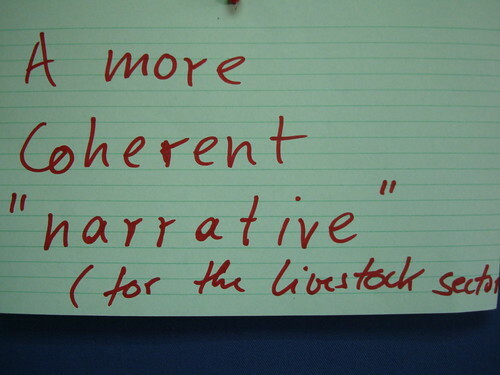 ‘I’d like to frame our discussions today by providing first a bit of context. Up until 2008 we all believed that food came from supermarkets. Then the world food market went topsy turvy. Prices rose and 100 million people were sent into poverty. Because prices for food were good for some poor farmers, 40 million people also rose out of poverty. ‘Since then, people are once again raising the old Malthusian theory—that massive geometric population growth in the face of arithmetic food growth is bound to lead to great social upheavals. Here’s what we’re facing. There’ll be 2.5 billion more people by mid-century. We’ll need 70% more food produced to feed the additional population. Specifically, for example, we’ll need 1 billion more tonnes of cereal grains by 2050 for food, feed and biofuels. Most of the additional food will have to come from land already farmed. ‘And we are not starting from zero. There are already 1 billion people in the world who are hungry! ‘75% of people who are poor live in rural areas, but they are at the receiving end of investments of only 4% of official development assistance for agriculture. ‘Donor support to agriculture has fallen from 1980 to 2009. The trendline is inching upwards, but very slowly—and it is not matching the need. ‘In Africa, food production has been increasing but it still lags behind population growth. Africa has been meeting its food needs largely from importation, US$14-billion-worth of cereals each year. This is not sustainable. The continent cannot continue to spend so much on food if it is also going to invest sufficiently in other sectors, such as health and education. ‘The Ford and Rockefeller foundations together financed research that led to the ‘Green Revolution’. This was a group of donors, around a table, with a big vision, which was transformative. My question is, will the creation of BecA be as transformative as that of the Ford and Rockefeller vision was in the sixties? I think it could be. What are the opportunities for BecA? ‘Every expert who has studied the food situation has said our best possibilities lie in the biotech sciences. People see biotech as a new frontier that has helped us in the past and can continue to do so in the future. We can now do things faster and with more precision. Look how quickly genomes can now be mapped. This opportunity could be seized and be transformative again. Think if we could produce maize as efficiently as sorghum. 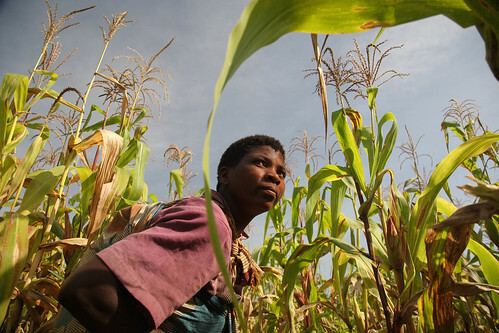 What would happen to the maize belt in Africa? Can we create plants whose photosynthesis is more efficient? Can the native African Boran cow produce as much milk as the exotic Jersey? ‘The facility to conduct such science is brought to Africa through the BecA Hub at a scale that could have great impact. It is also here at a size that can greatly help build biosciences capacity on the continent. 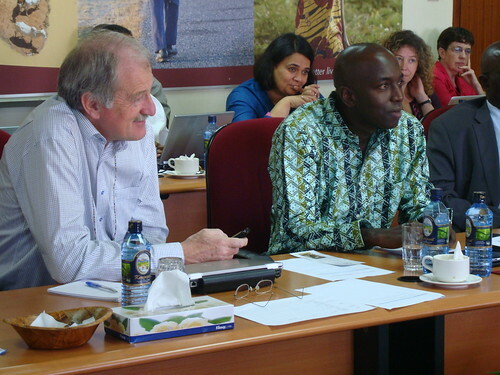 BecA Hub capacity can leverage the expertise of ILRI and the other centres of the CGIAR. 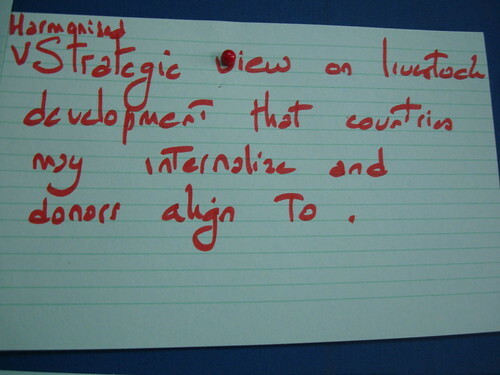 It can catalyze and add value to the agenda of the Comprehensive Africa Agriculture Development Programme. View the slide presentation Jimmy Smith made: The BecA-ILRI Hub: Realizing the promise, 13 Dec 2011. 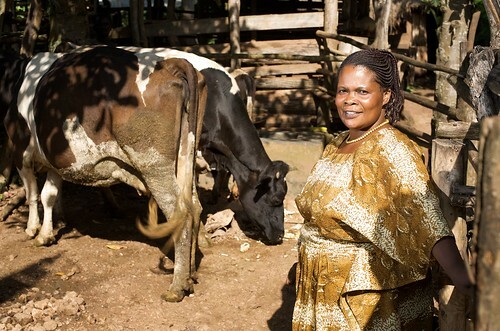 A small-scale dairy farmer with her cows in Uganda. 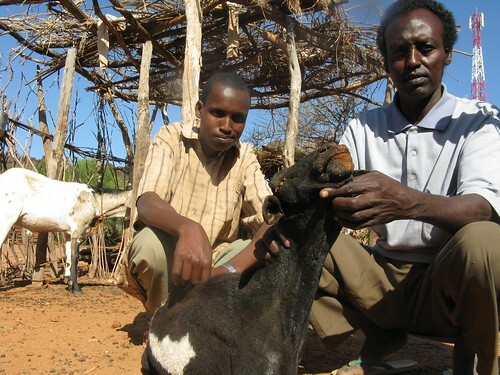 A new three-year project will identify and make available appropriate dairy cows for smallholders in East Africa to help them increase their milk yields (photo credit: EADD). A new project identifying appropriate dairy breeds for small-scale farmers in East Africa, and making these breeds more available in the region, was launched in February 2011 at the Nairobi campus of the International Livestock Research Institute (ILRI). The Dairy Genetics East Africa project—a partnership between ILRI; the University of New England, in Australia; and PICOTEAM, a consultancy group facilitating change processes—will help smallholders obtain the most appropriate cows for their farms so as to increase their milk yields and improve their livelihoods. Speaking to dairy stakeholders from Kenya, including officials from Kenya’s Ministry of Livestock Development, the East Africa Dairy Development (EADD) project and other dairy industry development partners, at the launch on 9 February 2011, Okeyo Mwai, a researcher and the project’s coordinator at ILRI, explained that even though smallholder dairying is booming in parts of East Africa, such as in Kenya’s central region and the north and southern Rift Valley areas, where farmers have adopted improved animal breeds and intensified milk production, many more smallholders lack research-based knowledge about which dairy breeds are best suited for their farms and production systems and information about where to obtain them. According to Mwai, ‘Kenya’s dairy sector currently does not have a clear “breeding strategy.”’ That means that many poor smallholders are unable to take advantage of breeds that best suit their situations. In the absence of appropriate breeding strategies and the ready supply of appropriate replacement stock, farmers face an unpredictable, unreliable and often costly replacement processes. 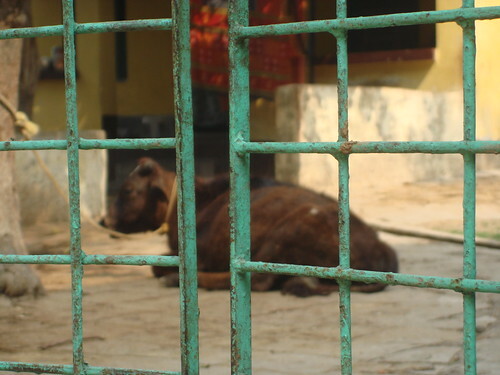 Many are forced to replace their animals from their existing animals or from their neighbours. Others go to large-scale commercial farms and end up ‘upgrading’ to the main commercial dairy breeds even where these don’t suit their farms. The project will be implemented in five sites in western Kenya and three sites in Uganda. The first phase of the project will start with gathering information to assess the relative performance of breeds in the sites, setting up partnerships with other stakeholders in dairy development in the region and developing business models that will be carried out the later (phase 2 and 3) stages of the project. In the first phase, project staff will collect information on about 3000 cows based on two monthly farm visits made over a period of 18 months. Field agents will compile information on the performance of the cows vis-vis farm-level inputs for a cost-benefit analysis of the different breeds. The agents will also collect information on farmer-perceived risks associated with different breeds, on means of livelihoods of the farmers, on any gender-specific preferences for certain breeds, and on farmer use of the various breeding services available and their costs. The breed compositions will be obtained using advanced genotyping technology, which will be led by John Gibson, the project’s principal investigator, who is based at Australia’s University of New England. This information will be combined with cow and household data to identify the most appropriate breeds for various dairy production systems and household circumstances. 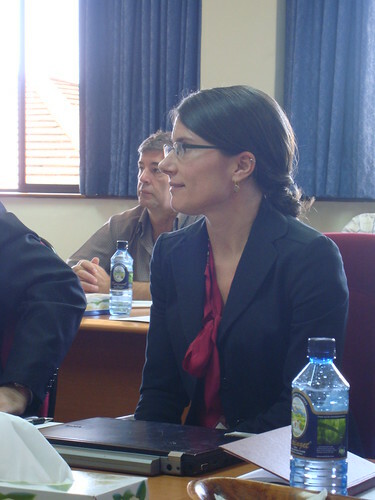 ‘This project will harness the diverse expertise of the key partners, and combine the latest technologies with tried and tested methods of engaging with the community, to answer critical questions much more rapidly and accurately than has been possible in the past,’ said Gibson, who formerly worked at ILRI as a livestock geneticist. Results from the project’s first phase will guide future dairy pilot studies in East Africa and will inform a comparative study of the South Asian dairy industry. The project is funded by the Bill and Melinda Gates Foundation. It started in September 2010 and is scheduled to end early in 2013. Small-scale farmers in sub-Saharan Africa, like this woman in Malawi, will benefit from a US$32 million initiative that is supporting research to boost production of vital food crops (photo credit: ILRI/Mann). Research funders from the United Kingdom, the United States and government departments from the United Kingdom and India have announced a UK£20 million (US$32 million) joint research initiative to relieve constraints to food production in sub-Saharan Africa and South Asia. The Sustainable Crop Production Research for International Development program, which was announced on 11 January 2011, will fund research teams from sub-Saharan Africa, South Asia and the UK working to improve the sustainable production of vital food crops. Funding will be awarded to teams that show their research can improve food security and increase crop yields within the next 5 to 10 years. Food security is a key concern across the world as countries face the challenge of producing and supplying enough safe and nutritious food in sustainable ways for their growing populations. Climate change, urbanization and rising food prices also are reducing access to food by many of the world’s poor people in developing countries. The program aims to establish mutually beneficial partnerships between researchers in the United Kingdom and developing countries through intellectual collaboration and also to enhance the scientific capabilities of its partners in the South. A joint multi-national initiative of the UK’s Biotechnology and Biological Sciences Research Council (BBSRC) and Department for International Development, together with the Bill & Melinda Gates Foundation (through a grant to BBSRC) in the USA, the Department of Biotechnology of India’s Ministry of Science and Technology, and the Indian Council of Agricultural Research, the program will focus on research conducted to counter the effects of stresses that are ‘abiotic’—e.g., drought, temperature, salinity, nutrient deficiencies—and/or biotic—e.g., pathogens, pests and weeds in nature—in nature. The program is offering standard research grants for projects of up to five years led by a principal investigator from any eligible institution. 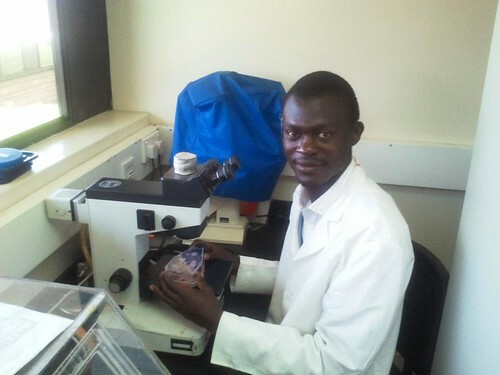 The program is also funding ‘Projects for Emerging Agricultural Research Leaders’, in which some 5–10 grants of up to £2 million in total will be awarded to four-year projects whose principal investigator is an early- to mid-career scientist from a developing country of sub-Saharan Africa or South Asia and employed in a national research program, institute or university. 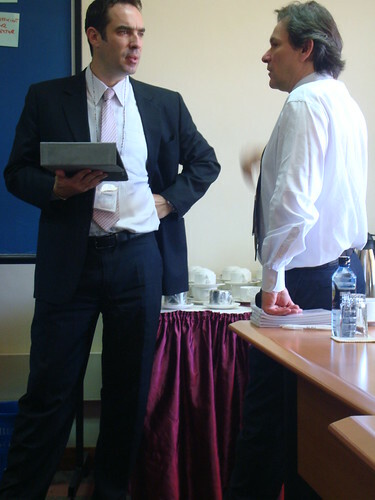 Successful proposals will focus on biological or biotechnological research and are to be submitted by 31 March 2011. The Biosciences eastern and central Africa (BecA) Hub, a regionally shared research facility hosted and managed by the International Livestock Research Institute (ILRI) in Nairobi, invites African researchers and scientists interested in exploring use of the Hub for this project to contact Jagger Harvey (crop research and related microbes: j.harvey@cgiar.org) or Rob Skilton (livestock research and related microbes: r.skilton@cgiar.org). The BecA Hub provides a common biosciences research platform, research-related services and capacity building opportunities to the region and beyond. The Hub aims to increase access to affordable, world-class research facilities and to create and strengthen human resources in biosciences and related disciplines in Africa. If you would like to be included in an open-access database of scientists interested in African agricultural improvement—which is managed by the Hub, funded by the Gates Foundation and designed for use by scientists, donor representatives and others—please contact the Hub’s communications officer Jane Hawtin: j.hawtin@cgiar.org. You can also visit the BecA Hub website: http://hub.africabiosciences.org. 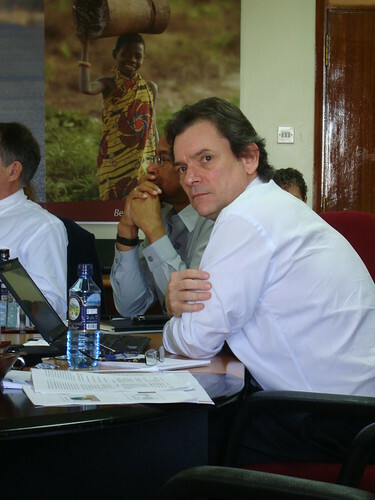 Carlos Seré, director general of the International Livestock Research Institute and member of a forthcoming expert panel on sustainable food production at the University of Minnesota (credit: ILRI). 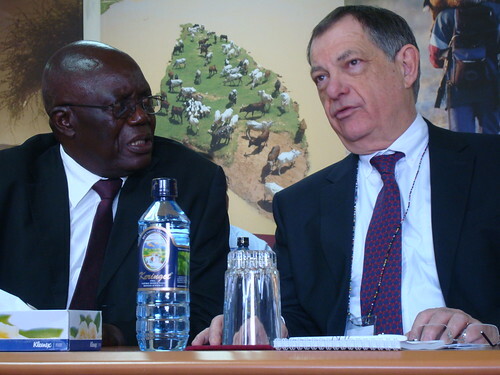 Carlos Seré, director general of the Africa-based International Livestock Research Institute (ILRI), is one of three leaders of worldwide agricultural research centres who will discuss how increasing global demands for food can be addressed in sustainable ways during a forum on 'Sustainably Feeding the World' next week at the University of Minnesota (USA). The panel discussion will start at 1:30pm, on Monday, 18 October 2010, in the university's Cargill Building for Microbial and Plant Genomics. All three panelists are directors-general of international research institutes that are part of the 15-member network known as the Consultative Group on International Agricultural Research (CGIAR). Besides Carlos Seré, who leads the International Livestock Research Institute, based in Nairobi, Kenya, the panelists include Shenggen Fan, of the International Food Policy Research Institute, based in Washington, DC, and Ruben Echeverria, of the International Center for Tropical Agriculture, based in Cali, Colombia. Fan and Echeverria are graduates of the university's Department of Applied Economics. 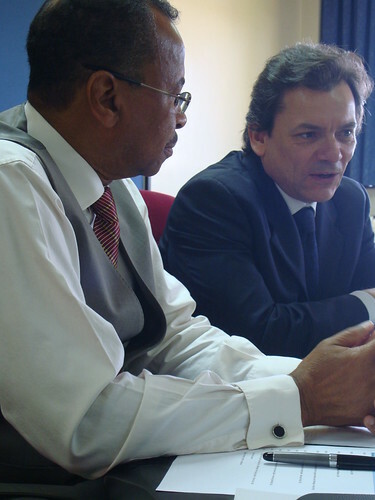 Later in the afternoon of 18 October 2010, Echeverria will be awarded the university's Distinguished Leadership Award for Internationals. The department also will celebrate the accomplishments of the late Vernon Ruttan, who advised both Echeverria and Fan, with a ceremony officially naming its home building 'Ruttan Hall'. 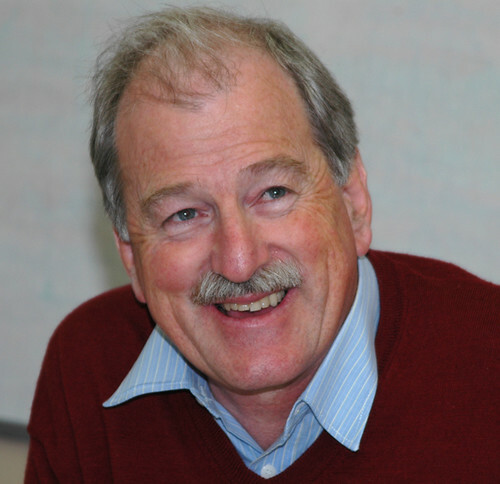 Philip Pardey, of the university's Department of Applied Economics, co-directs a CGIAR HarvestChoice project and will moderate the panel of speakers. HarvestChoice works with all three international centres with funding from the Bill and Melinda Gates Foundation. Prabhu Pingali, Deputy Director of the Agricultural Development Program of the Gates Foundation and an international expert on global food issues, also will attend.